Braised Short Ribs Recipe - Let the Baking Begin! 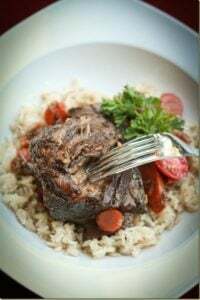 This simple and delicious Braised Short Ribs Recipe is Beef Short Ribs cooked into tender and juicy meat chunks. Try this recipe with a side of Mashed Potatoes. As the Braised Short Ribs are cooked over several hours in a bouquet of flavors, the meat becomes very tender, juicy and flavorful. Typically, ribs have a good amount of fat threaded throughout each piece which tenderizes the meat as it cooks. Properly cooked ribs will hold their shape when transferred from the pot to the plate but will fall apart as soon as you stick a fork into the meat, and melt in your mouth when you eat them. These Braised Short Ribs are a great dish to serve when you have company over. 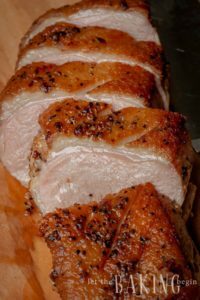 Not only are they delicious, but they are very easy to make since they don’t involve a lot of steps and can be prepared hours before and then reheated. In fact, if you make them a day ahead and then reheat right before, they are even better because all the flavors have had the time to mend. This Ribs Recipe calls for red wine, but if you white wine is what you have, use white wine. You can even omit it completely if you would rather not cook with alcohol. Heat a large dutch oven over medium/high heat until thoroughly heated through. With 3-4 Tbsps of olive oil, sear the ribs a couple pieces at a time until well browned. Remove meat to a bowl. Add diced onions to the pot and cook for 5-7 minutes. Cook until lightly browned. Set aside ½ the chopped carrots, and add the rest to the pot. Cook carrots for 3-4 minutes. Add the short ribs with the juices that have leaked out. Pour enough stock to keep the short ribs submerged, about 3 cups. Then add ½ cup of wine. Season with salt, pepper, bay leaves, mustard seeds, and a couple peeled garlic cloves. Cover pot with lid and cook on a low simmer for 2.5 hours. It is important to check on the meat periodically and turn the meat pieces if some of them are not covered by the liquid. Once the ribs are almost ready, add 1 cup of the reserved carrots, and 2 garlic cloves. Stir everything together, cover and cook for an additional 20 minutes. Skim any fat that pools at the top and discard. Serve over mashed potatoes, creamy polenta, grits, or pasta right away. This Beef Ribs Recipe is a family favorite! It’s such a simple recipe and the perfect comfort food! 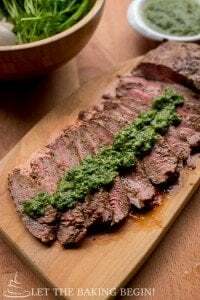 The combination of beef, carrots, onions, and wine make the most tender and juicy beef! 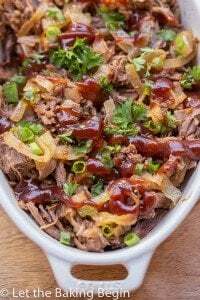 Garlic Barbecue Pot Roast – Pot roast smothered in a garlic barbecue sauce. One-Pot Easy Beef Stew Recipe – Great instant pot beef stew made in minutes! 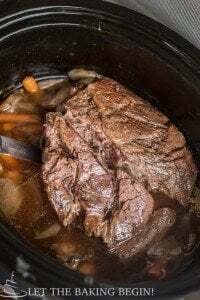 Perfectly Simple Pot Roast – Slow cooker beef cooked with vegetables! Heat a large dutch oven over medium-high heat until thoroughly heated through. Add 3-4 Tbsp of olive oil to the pot and then sear the short ribs a couple pieces at a time until well browned, about 45 seconds to 1 minute per side. Do not overcrowd the pot or the meat will start to release juices, which will prevent browning. Remove the meat to a bowl. Add the diced onion to the pot and cook for about 5=7 minutes, frequently stirring, until slightly browned and translucent. Set aside 1/2 of the chopped carrots and add the rest into the pot. Cook the carrots for 3-4 minutes, stirring often. To this, add the short ribs with the juices that have leaked out. Now add 1/2 cup of wine - red is best, but white is fine too. Season with 2 tsp salt and 1 tsp black ground pepper, followed by 2 bay leaves, 2 tsp mustard seeds, and couple cloves peeled garlic. Stir and taste for seasoning. You want the liquid to be well seasoned since some of the salt will be absorbed by the meat. Cover with lid and cook on low simmer for about 2.5 hours, or until the short ribs are almost fork tender. As the short ribs are braised, some of the liquid will evaporate and leave some of the short ribs not covered with liquid. That is it is important to check on the meat periodically and turn the meat pieces if some of them are not covered by the liquid. This will ensure that the meat is cooked through, all the way around. When the meat is almost ready, add the 1 cup of reserved chopped carrots and 2 cloves garlic. Stir and cover with the lid and cook for another 20 minutes or until the carrots are soft and meat is fork tender. Also, which red wine did you use? Thanks! Chianti works best in this recipe. This sounds delicious! Will be making tomorrow. 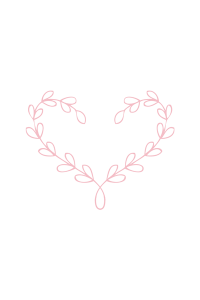 What kind of stock do you recommend? What kind did you use? I usually buy the organic chicken or beef boullion paste from Costco. Would that work? Also, you said you can make them a day ahead and they will still taste good. Would you just reheat on the stovetop the whole pot? Please let me know. Thank you so much for your amazing recipes! Yes, that is exactly what I use! I love that stuff! I know it’s not the healthiest, but it sure works like magic in recipes. To reheat, you can either slowly heat it on the stove top or place it in the oven and heat it there. Either way, use gentle heat so it doesn’t scorch the bottom. Beef with Caramelized Onions and Mushrooms - Let the Baking Begin! Do you use chicken stock? You can use chicken or beef. I just use whatever I have. it is about 4 lbs and yes Merlot would work just fine. I do get the boneless, but bone in will work just as good. I get mine at Costco by all the beef, steaks and such. They are sold in long strips of meat about 2 inches thick.